The Kanetsune Large Petty Chef's knife is a must have for any kitchen. Featuring a 6.125" Damascus steel blade with a VG-10 stainless steel core, the Large Petty makes your cutting tasks a breeze. Comfortable contoured black wood handles provide an excellent grip on the knife. 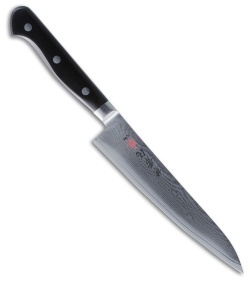 The polish stainless steel bolster is an attractive accent to the dark handle and Damascus blade.